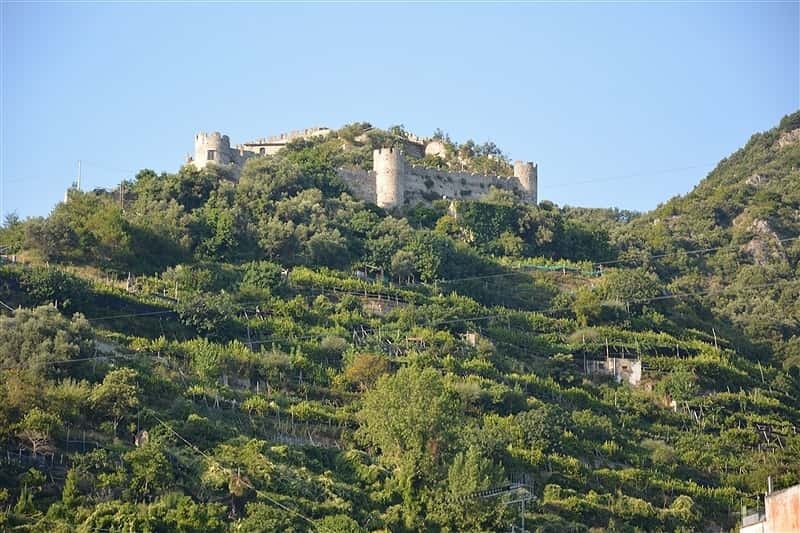 The Castle of Maiori appears on the summit of the hill which dominates the villages of Accola and Carpineto. In reality the old ruins cannot be considerate a castle in the literal sense, but a protected and entrenched area as well as the jurisdictional centre of a feudal Lord. It consisted of a rock, a fortress erected as a bulwark and refuge for the population against the frequent attacks of the outlaws from Lombardy and later the Barbary pirates. "Cerasuoli" records that the construction began a few years after the death of "Sicardo" a Lombard Duke of Benevento in the year 840. "Sicardo" had in the preceding year (839) devastated and pillaged the villages on the Amalfi Coast. The fortress was built around an ancient church dedicated to S. Nicola de Thoro-Plano. However the building in its current shape was reconstructed and enlarged by the Duke of Piccolomini (a family from Siena) which in 1461 was nominated by Ferdinando I of Aragona as feudal Lord of the Amalfi dukedom. The final construction was begun in 1465 and completed in 1468. It cost the city 6000 ducats. The castle was described near the end of the fifteenth century by the historian Michelangelo Gizzio of Ravello, the author of the essay De tuitione Regii Demanii status Amalphiae (About the defence of the Amalfi dukemon): ):"...et in nobili et fortissima Terra Majoris, quae propter turres in maritimis constructas, ceneis tormentis munitas, et fortissimo castro in eminenti ori parte ipsius Terrae, quod Sancti Nicolai dicitur quasi inexpugnabilis redditur." (...and in the noble and strong land of Maiori, which thanks to its towers constructed by the sea, armed with cannons and thanks to a well armed castle, which was built on the highest summit of the land called S. Nicola, was rendered nearly invincible). The fort, as mentioned above, contained an antique church with three vaults and bell-tower, dedicated to S. Nicola de Thoro-Plano. It is worth mentioning that Thoro-plano means a knoll, a rolling hill, as opposed to the Thorus clivus, a steep hill which today is commonly called Torina or Tuoro, and corresponds to the area which is found above the areas of "Campo" and "Paie". It is important to remember that an imposing fortress protected by a turret and a dug-in camp dedicated to S. Michele Arcangelo was built in the IX century on the slopes of the Torina (Thorus clivus); the position of the fortress allowed signals to be sent to the Castle of Thoro-Plano in case of emergency. With reference to the Castle of Thoro-Plano, it is opportune to add that inside the fortified perimeter there were once barracks and shelters able to house to a large battalion and hundreds of citizens seeking shelter. There were also stores and water cisterns on the western side and there was a spring in front of the Fossa Lupara (Santa Caterian) which guaranteed the water supply in case of long siege. The building, as it appears currently, still preserves its original form with a polygonal perimeter which continues for 550 metres. The battlements equipped with spyholes and buttreses are separated by nine small cylindrical towers approximately 8 metres high with a diameter of 5 metres. "...And a large castle in which to seek refuge in the extreme events of conquest of the bulwark was built on the "Posula" hill, between the villages of "Accola" and "Carpineto", at about 1/3 mile from the fortress of S.Angelo and S.Sebastiano; it is formed by a circuit of walls which goes on as you may still see now for 270 geometric steps or 550 linear metres in an undefinable shape, more or less following the slopes with 9 semicircular towers placed at varying distances, with battlements and spyholes, an army barracks and huts able to house a strong army or a few hundred citizens , opportunely provided with stores and water cisterns. There is also a spring on the western slopes and a church with three vaults with bell tower on the southern slopes under the name ofS. Nicola de Thoro-Planofrom which the castle takes its name. These fortifications withstood multiple assaults, resisting the assault from Pisa which took place in 1137, when two years later after Amalfi had capitulated and the other castles on the coast had resisted, the Pisani were overcome with great difficulty and conquered. The fortifications of Maiori were re-built as you can still see, but there remains little more than a remembrance of the others. Of the Thoro-Plano Castle remain the walls, the towers which have managed to withstand the weather. Until 40 years ago there remained also a good part of the army barracks and huts. At that time the walls of the church and the bell tower were still standing, although it was knocked down in 1593 when incomes were confiscated. Subsequently the weather and the neglect left them in a poor state though until recently foreigners and locals visited the spot during the Easter and Pentecost, but the recent political events had also prevented this therefore the interior was used for growing various crops...". Opening times: 8 a.m.-1 p.m.